1X - $80.99 2X - $80.99 3X - $96.99 Only 9 left! Does the thought of living on the road, driving a VW Bus and waking up to birdsong cause an itching at the bottom of your feet? No, that's not athlete's foot. You've got itchy feet, a sign of the wanderlust that comes along with the desire to be a free spirit. The hippies had it right when it came to a lot of things. For one, the open road belonged to them. A stereotypical hippie lived day to day, went where ever the sunshine was brightest and the flowers were free for the picking. And hey, they had great style while they traveled. The lack of inhibitions when it came to where they slept also applied to what they put on their body. When they threw off conventions they came across all sorts of fashionable discoveries. 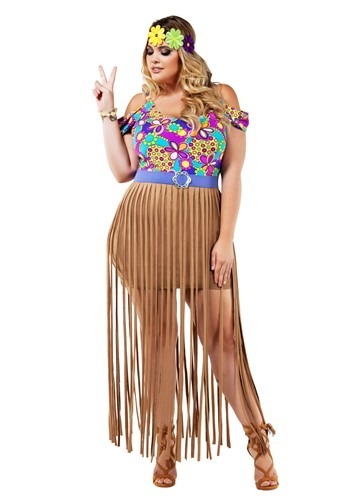 How awesome does buckskin fringe look when paired with florals? This hippie ensemble is unrestrained with wild fringe that moves with any funky dance moves that you might come up when grooving to Hendrix's jams. The buckskin inspired skirt is attached to the periwinkle belted waist and topped with a classic seventies patterned top. Typical of the era, this floral pattern is psychedelic with wild colors and swirls. You'll feel comfortable with both on the shoulder and off-shoulder straps for an easy-going look. Whether you're heading to a hippie-themed costume party or you're simply doing Halloween in a supremely groovy manner, you're sure to feel like a true blue flower child when you're rocking this look. Just be careful, this look is catching. You might feel yourself getting drawn to the sweet scent of Patchouli or taking part in the rag-tag ranks of a drum circle. While don't be too hard on yourself, you've got to follow your bliss! 1X Fringe Length 38" 38"
2X Fringe Length 38" 38"
3X Fringe Length 38" 38"